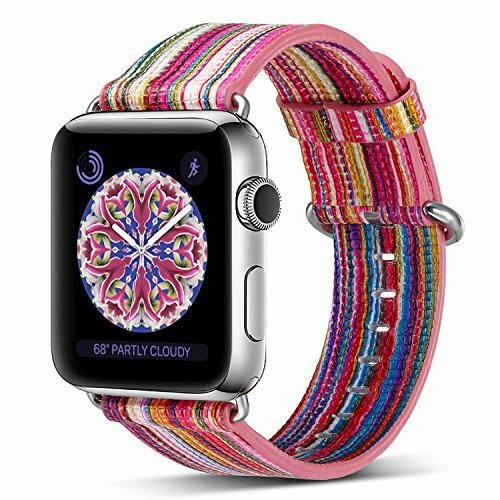 High quality product, Good customer service have always been TOKASA's pursuit.The Fashion Colorful Replacement Band for apple watch is both practical and fashionable.It can be men's or women's, comfortable SOFT feeling on your wrist, simple but attractive, look fantastic and giving a nice fashion look on any occasion. 2.Only 38mm Leather watch band in the package.NOT including apple watch. 3.The REAL COLOR of this item may be slightly different from the pictures shown on the website caused by many factors. Such as brightness of your monitor and light brightness. And because of the natural variability of the leather used in this band, the color may vary somewhat. However the style, quality and service are all the same. 1.TOKASA sales team would endeavor to win 100% customer satisfaction and guarantee 180 days warranty. 2.We always work hard to ensure high quality standards through 3 times quality checks, while we regrettably still come across defective items occasionally.Please kindly let us know at the first time if got defective items. 3. If you're not satisfied, before leaving negative feedback, please CONTACT US. Our TOKASA will help the trouble shoot with 100% efforts and sincerity to make you satisfied. 1. Click on "TOKASA" next to "Sold by", then click on "Ask a question" on the right top of page. 2. Log in your Amazon account > choose "Your orders" > find the order ID > click "Contact". If you have any questions about this product by PierreCase, contact us by completing and submitting the form below. If you are looking for a specif part number, please include it with your message.